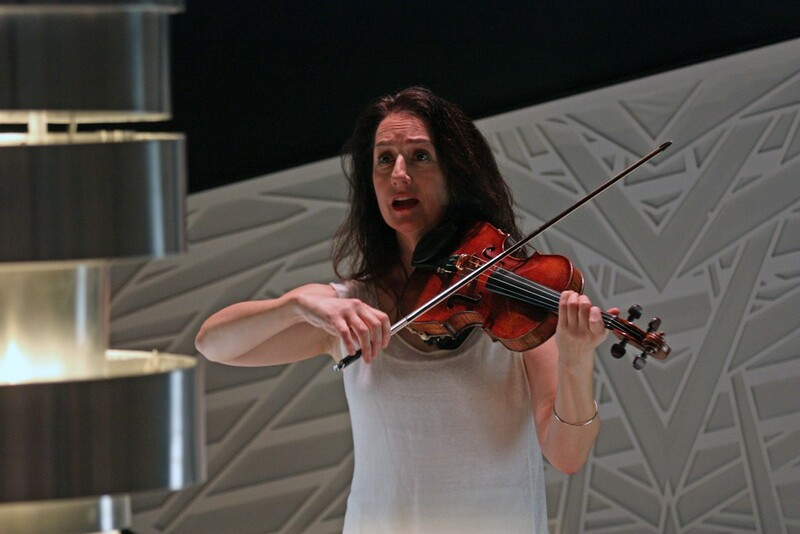 The violinist Monica Germino in "Muted," presented by the Philharmonic at National Sawdust in Brooklyn. Violinist Monica Germino performs on a frame violin, which is quieter than a traditional violin, at New York’s Lincoln Center. "...'Muted' may be the quietest piece ever written for violin, but it was riveting in this intimately powerful performance." "On Monday night, the Andriessen celebration continued at National Sawdust in Brooklyn, where the impressive and courageous violinist Monica Germino gave the American premiere of “Muted,” a 40-minute, musical-theatrical work written for her by four composers: Michael Gordon, David Lang, Julia Wolfe and Louis Andriessen. Ms. Germino was a champion of contemporary music, including experimental works with percussion and electronics, when, a few years ago, she was diagnosed with a hearing condition that rendered her extremely sensitive to sound. She must avoid exposure to high volume of any kind. “Muted” was the response of four composer colleagues. The piece involves very soft sounds played on an array of violins, from traditional to experimental, and used various standard mutes (brass pieces fitted on the bridge of the instrument to muffle sound). During parts of ”Muted,” Ms. Germino also sang or spoke fanciful texts by Don Marquis and moved around a central, light-projecting circular tower of aluminum rings (designed by Floriaan Ganzevoort). While wistful, the music shifts through moods and styles that alternately suggest tender folk songs, gently swaying dances, bursts of hushed busyness, bluesy melodies, even twangy hints of hoedown. “Muted” may be the quietest piece ever written for violin, but it was riveting in this intimately powerful performance." In her decadeslong career, the violinist and contemporary-music specialist Monica Germino has worked alongside major composers, co-founded an international ensemble and performed at venues world-wide. But in recent years, her life has been derailed by a disorder that connects in the most direct way to her profession: Ms. Germino has hyperacusis, a sensitivity to sound. The violinist’s solution? She is going the quiet route, performing music specifically written for her with the auditory condition in mind, and asking audiences to join her on the journey. On Monday and Tuesday, Ms. Germino, who is based in Amsterdam, will offer the U.S. premiere of “Muted,” a piece co-commissioned by the New York Philharmonic with four other musical organizations, at National Sawdust, the Brooklyn venue that specializes in innovative work. “It’s borne out of necessity,” said Ms. Germino of the piece. But at the same time, “something incredible can happen” musically from such circumstances, she said. But it is another contributing composer, New York-based Michael Gordon, who came up with the idea for the work. When he learned in 2016 that Ms. Germino had stopped performing altogether because of her disorder, “I said, ‘You can play quiet music. We’ll write you the quietest piece ever written,’” Mr. Gordon recalled. Ms. Germino helped the process along by using special violins that are designed to play at a softer level or adapting a traditional violin with the use of mutes – essentially, a device that causes the strings to vibrate less. She has also had a new instrument, dubbed a whisperviolin, made for her. The composers involved explain that “Muted” isn’t necessarily difficult for audiences to hear. Mr. Gordon said concertgoers just need to pay closer attention. He likens it to stepping into a dimly lit room and adjusting your eyes until you can see clearly once again. While Ms. Germino may have found a way to adapt to her situation, she is far from the only musician to contend with hyperacusis, which is often associated with exposure to loud sound. Indeed, musicians are “fundamentally at higher risk” for the condition, said Bryan Pollard, founder and president of Hyperacusis Research, a U.S. nonprofit organization. At its most extreme, the condition can cause those who suffer from it to experience pain when they hear noise or certain sounds, say experts. Ms. Germino said in her case, she is just “very sensitive” to loudness. But she had been advised by auditory professionals to quit playing or wear earplugs, lest she risk damaging her hearing. Neither of those options proved suitable, so that led to her current solution. Regardless of her condition, Ms. Germino thinks there may be a broader benefit to turning down the volume and seeing the value in the quiet. “We are so swamped with sound and overstimulated,” she said. Watch live TV broadcast of Podium Witteman here -the segment about MUTED starts at 6'55" (in Dutch). Music: 19'30"
"...As the pop-up artist, Monica Germino will decide what she will actually play in the moment. It will certainly be soft, because a few years ago Germino was diagnosed as 'sensitive to sound,' which means that her ears are more prone to damage [from high decibel levels]. She had to say goodbye to the high-octane soundtracks and louder works for electric violin, giving up many pieces she had often performed. De Volkskrant: "Violinist Monica Germino can..."
The American-Dutch violinist Monica Germino, known for her electronically amplified performances of music by contemporary composers, is given the worst conceivable news three years ago: she has to stop making music or take drastic measures to protect her hearing. She has known for a long time that she is 'sensitive to sound,' which means that sound enters her ears at a higher level than it would to others hearing the exact same sound. That is why her ears are more prone to damage. The loudest violinist in the country can now only play very softly. She also calls Michael Gordon, the world-famous American composer, to cancel a project. 'Then everything changed. For Michael, stopping was not an option. He said, "I am going to write you a very soft piece. And I want to be the first to do this for you." Two colleagues from the New York collective Bang on a Can, Julia Wolfe and David Lang, join forces. They have been working with the theme of silence for some time; for example, Lang wrote a 'whisper opera.' Wolfe had written a piece for Germino before. The Dutch composer Louis Andriessen, who composed several pieces for Germino, is asked to be artistic leader. The result, MUTED, will premiere tomorrow at the Oranjewoud Festival. Germino can play again. 'The composers saved me,' says the violinist. Two historical 'frame violins' are featured in MUTED. A frame violin is a violin without a sound box. Just like an electric violin, but acoustic and unamplified. A violin without a sound box is extremely quiet. Such an instrument is usually used to practice (to spare the neighbors). The renowned industrial designer Marcel Wanders, former amateur violinist, has also built a spectacular whisperviolin with luthier Bas Maas. Instead of the traditional scroll found on normal violins, the whisperviolin has a finger, as if to say: shhh. Muted. 7 (try-out), 8 (premiere) and 9/6 2018, Oranjewoud Festival. Next season (international) tour. The whisperviolin, made for Monica Germino by designer Marcel Wanders together with luthier Bas Maas, is a violin that produces fewer decibels than the normal, acoustic violin. It is inspired by the seventeenth-century 'pocket violin:' a violin with a narrower sound box, then used by dance masters. She also plays two frame violins: violins without a sound box, only the 'ribs.' These instruments were made out of the leftover wood from making violins. The sound is softer and rich in overtones, which are higher tones that vibrate sympathetically with the sounding tone. An ordinary violin can also be made to sound softer when using a sourdine, also known as a mute. This is a clip made of wood, plastic, metal or leather, which is placed on the bridge, limiting or altering the vibrations. Germino now has a collection of hundreds of sourdines. Premiere: 8 & 9 June 2018 at 20.00 & 22.00, Oranjewoud Festival, Museum Belvedere. Try-out performances on 7 June at 20.00 & 22.00. Central to Monica Germino’s work is her unusual family of instruments, as well as her ever-expanding collection of mutes. Germino’s ongoing search has resulted in over 400 vintage, modern, and newly commissioned mutes. A mute (a.k.a. sourdine, sordino, demper) can alter the sound of the violin in countless ways. From Canada to Spain, mute-makers are experimenting with new designs and all kinds of materials – leather, metal, cork, magnets, plexiglass, bone, rubber, paper, textiles, the list goes on. Special thanks to Stam Vioolbouw for their marvelous donation to the collection. MUTED premiered on 7 - 8 - 9 June 2018 at the Oranjewoud Festival and goes on tour in fall 2018. The specialists were unanimous: my ears are highly sensitive to sound. ‘Geluidsgevoelig,’ in Dutch. It sounded almost positive to me, ‘sensitive to sound.’ It’s also not uncommon. But a high sensitivity to sound means that my ears are more prone to damage. A person standing next to me could be exposed to exactly the same sounds, yet not be affected. The advice was clear: I needed to protect my hearing by significantly reducing my exposure to high decibel (dB) levels. Decibel levels and the key concept of duration: what is considered safe? How many dB for how long? Impossible questions to answer infallibly, but working with the Audiologisch Centrum Hilversum brought clarity to a complex situation. They measured the decibel levels of different violin mutes (a.k.a. sourdine, sordino, demper), giving estimates and advice about a multitude of issues. Many thanks to experts N.J. Versfeld and J.P. Kronemeijer, and Oorwerk’s Stijn Hoogeboom in Hilversum. A runner hears: if they keep running at high speeds, chances are high that in future years they’re going to have serious knee pain. They might even need surgery. But if they slow down to a fast walk, chances are they could avoid that. So the runner chooses to protect their knees by going from running to a fast walk. In hearing terms, my ‘fast walk’ is about 80 decibels. My acoustic violin can measure 90-95 dB under my ear. How I would move ahead and with what means were all unknowns. Confronted with the fact that it would be reckless to continue exposing my ears to a high level of decibels, I had to make choices. I was lucky that I learned this sooner rather than later. I consoled myself with that knowledge while evaluating the decibel levels of treasured and prospective collaborations. I said farewell to click tracks, bass drums, and high-volume soundtracks. I sifted through pieces that were simply too loud for me now, many of them close to my heart, and started the process of finding them new homes, new interpreters. Limits inspire creativity. MUTED opens doors for a new voice. There's power in quietness and strength in speaking softly. Cue the new music community: resourceful, supportive and stubborn composers and colleagues who lifted me up and pulled me along this fascinating journey. Ups and downs and the unexpected began to feel like the status quo. Michael Gordon's response to what was drastic news to me —having to protect my hearing by stopping or adapting how I played the violin — was one of optimism and curiosity. I'll never forget his words: “I’m going to write you a piece so soft, I don’t care if no one can hear it.” Michael, David Lang, and Julia Wolfe decided to join forces to create MUTED, “the quietest violin piece ever written.” The three later invited Louis Andriessen to join in the experiment, fulfilling a long-held wish to collaborate. There is an enormously talented and resourceful pool of people involved, including stage and light designer Floriaan Ganzevoort, executive producer Neil Wallace & De Doelen, numerous mute creators, filmmakers, audiologists, producers, commissioners, as well as a swath of venues and festivals. The list* is long and heartwarming. Special thanks to luthier Bas Maas and designer Marcel Wanders, who are creating an entirely new, lower-decibel instrument, a ‘whisperviolin,’ inspired by and loosely modeled on the 17th-century ‘pochette’ violin, but made to explore the world of quieter sounds. Besides unmatched creativity and unparalleled skill, both bring a sense of adventure and a palpable excitement to the process. MUTED has its roots in the reaction from composers to my high sensitivity to sound and having to cut down the amount of decibels pouring into my ears. I used to play pretty hard-hitting music, much of it newly commissioned. I took measures to protect my hearing and left the world of orchestral playing many years ago, but I was probably one of the loudest violinists around. And as Mehitabel** would say, “I have no regrets!” But saying farewell to a repertoire close to my heart has its difficult moments, and tough choices abound. It’s new territory for me, there’s an uncharted development process ahead, and a completely new sound world to figure out. My work has always been composer driven, and I am extremely grateful to and moved by the active role composers and colleagues are taking in this enforced, bewildering, and somehow increasingly exciting development in my creative path as a musician. To add to the instrumentarium, luthier Bas Maas and designer Marcel Wanders are creating an entirely new, lower-decibel instrument, a ‘whisperviolin,’ inspired by and loosely modeled on the 17th-century ‘pochette’ violin, but created to explore the world of quieter sounds. When Wanders took on this challenge, he spoke about decibels and sound and his fascination with “designing a violin for Monica, and how this could ultimately also help other violinists.” Marcel Wanders played the violin for 6 years and reveres its history, shape, and form. Bas Maas is on a quest for ways that unconventional ideas could possibly work. Besides unmatched creativity and unparalleled skill, both bring a sense of adventure and a palpable excitement to the process. "Why don’t you just use earplugs?” For those who do and can still enjoy music-making, that's great. I tried this option for many months, but it felt like sensory deprivation. I rely on (and love) the subtle sounds associated with playing the violin. It's essential for me to hear the tapping of my left hand on the fingerboard and the sound the hair of the bow makes when touching the string. Earplugs blocked those sounds out. This all contributed to my decision to bring down the volume of the violin instead of muffling my ears. That said, of course I fully support the use of hearing protectors. "What is hyperacusis?" This is something I suffer from, albeit to a lesser degree than described in the majority of the cases I have read about online. I notice hyperacusis during activities like emptying a dishwasher- the sound of a plate striking another plate is an unpleasant, jarring sound for me. I hesitate to provide a comprehensive link to any one source, as there is a lot of information out there. WBUR article: Are earphones or earbuds a problem? There is a flood of information, research, and articles about hearing protection and hearing disorders available online and in print. I have found that the majority focuses on musicians who play amplified, and orchestral musicians (too many cases for me to document here). MUTED premiered on 7 - 8 - 9 June 2018 at the Oranjewoud Festival in Museum Belvedere, and goes on tour in fall 2018. The collective composition MUTED features violin, voice, whisperviolin, frame violins, hundreds of mutes, and light design. Created in response to Germino's high sensitivity to sound, Michael Gordon, David Lang, and Julia Wolfe joined forces to create a piece that explores the limits of audibility. The three composers invited Louis Andriessen to join them in the experiment, fulfilling a long-held wish to collaborate. Floriaan Ganzevoort designed a light object based on sound waves, controlled live in performance. This intensely theatrical piece is conceived for small groups of listeners in intimate spaces. MUTED may owe its origins to four composers paying tribute to the determination of a single musician, but it is also a reflection on silence, on the act of listening, an antidote to the noise and the ever-increasing clamor of today’s world. The piece has been commissioned by an international consortium of presenters and is produced by De Doelen in Rotterdam. June 2018 marked the world première at the Netherlands’ Oranjewoud Festival, as part of Leeuwarden’s 2018 Cultural Capital of Europe programme. Live TV broadcast Podium Witteman -the MUTED segment starts at 6'55" (in Dutch). Music: 19'30"
Spring Loaded Festival: 10 years of Red Sofa. De Doelen Rotterdam. Premiere of MUTED: 8 June 2018 at 20.00, Oranjewoud Festival, Museum Belvedere. Performances from 7-9 June. Welcome to the newest addition to the family, which thus far includes a Ceruti from 1802, a Violectra by Dave Bruce Johnson, a modified violin for INDUSTRY, Mr. Blue (seeing is believing), and more coming up...watch this space! This frame violin, also known as a mute violin, is from ca. 1870. It has a beautiful, intimate, overtone-rich sound. Surprisingly little is known about these striking instruments. One resource is the National Music Museum at the University of South Dakota.